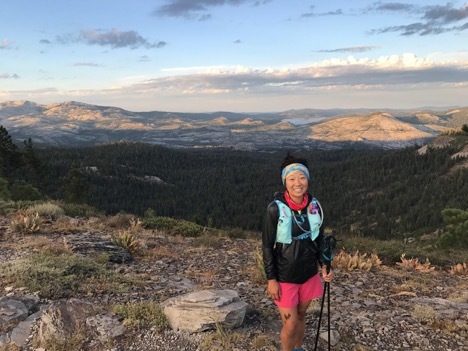 Last August, I completed Bigfoot 200 and could not conceive of how my friends were going on to complete Tahoe 200 just three weeks later. The idea of doing back-to-back 200s seemed impossible to me at the time. Throwing in a third once seemed inconceivable. Several months later, I found myself feeling inquisitive and eager to find out if it was possible for me to accomplish the Triple Crown of 200s. I knew it would allow me to better explore my limitations, connect with more people, experience a wider range of emotions, explore more trails, and seek out self-growth. What I did not realize is that it would result in lifelong friendships, discovering better versions of myself, hitting my most extreme emotional lows, finding my limitations, and developing a new sense of what it means to have self-compassion. Rather than go into detail about each race, I would like to focus more on brief summaries of each race, the lessons I learned, what I could have done better, and tips. If you are wanting to hear more about my experiences, please feel free to check out race reports on my website, katiegraff.com. The majority of Bigfoot 200 went smoothly and I was ahead of the majority of my splits from last year. I had an incredible amount of support out there with pacers from mile 46 to the finish. My friends, Jeremy, Sean, and Dan, all came out to share some miles with me. After getting to mile 160, I ended up getting hypothermia and had to crawl in my bivy sack while Jeremy and another friend, Noel, tried to warm me up. I later learned that having stick on heating patches are extremely helpful during cold nights. I had plenty of layers and hand warmers, but having those patches on my back for the other races was helpful. Once I finally warmed up, I started dry heaving and struggled with keeping food down. During the last twenty miles, I ended up injuring my anterior tibialis tendon from all of the steep downhill. I could not dorsiflex without sharp pain, and as a result, I ended up power walking the last 20 miles. For the last several hours, Jeremy helped keep my spirits up as we joked around, picked some blueberries, and created a solid friendship. I went into Tahoe 200 feeling excited, strong, and positive. Two my good friends, Julie and David, were also racing and it was their first 200! I was also extremely surprised to see my friend, Shaun, at the Reno Airport. Due to the fires and smoke, he had to stop his journey on the PCT, but never informed me of this! He stood there near the baggage area with a welcome polar bear sign ready to help pace and crew for me! Unfortunately, I started having nutrition issues before mile 50 and was dry heaving. I struggled with keeping food down from around mile 50-120. I also started to feel some sharp pain in the top of my right foot when pushing off from my toes. I loosened my laces thinking that they were too tight, but this was not helpful and I ended up having tendonitis. At the time, I was unaware of this and some of the medics informed me that it looked like a stress fracture due to the inflammation and bruising. It was challenging trying to make a decision about whether to go on and risk long term damage. I resorted to doing a lot of marching to avoid pushing off from my toes. At mile 123, I thought I would need to drop. It took me 10 hours to complete 20 miles. I did not foresee how I could meet the time cut offs at that pace. Fortunately, a good friend and medic, Craig, suggested that I ice, elevate, and sleep. After waking up, I did feel better and continued on my journey with my new friend, Jason. We had met through the sign-up sheet for pacing and I had reached out to him. Jason and Shaun ended up taking turns pacing and crewing for me until the finish. They both shared incredible stories with me, humored me and my hallucinations, shared many jokes, kept me on the trail when I was too sleep deprived to walk straight, encouraged me to keep going, reminded me to eat/drink, and stayed incredibly supportive when I was vulnerable, negative, and/or emotional. I went into Moab knowing my tendonitis was not fully healed, but hopeful that I could still finish. 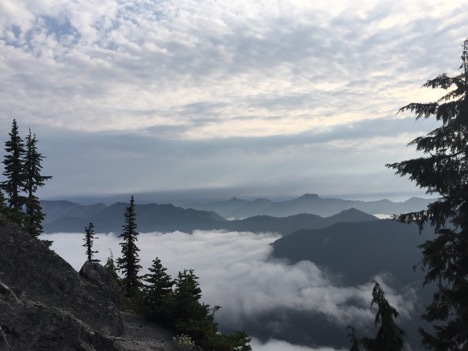 Shaun lost his mind at Tahoe 200 (or perhaps it was on the PCT!?) and decided to come out and join me again! My coach, Jason Koop, also came all the way out to support me. Despite not being completely injury-free, I was excited to start and finish this journey with these incredibly supportive individuals. Living in Austin, Texas, I am very accustomed to humidity and the dryness at Moab took its toll on me. I ran out of water seven miles before the second aid station. Fortunately, I was in good company and ran a lot of the first few sections with my friends, Sylvia and Mika! 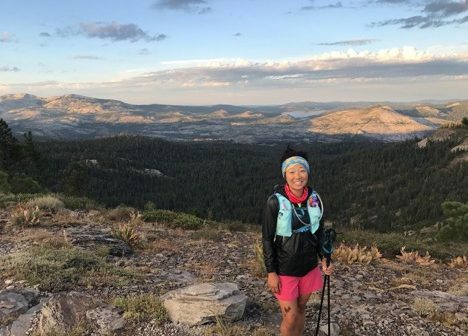 Slyvia also completed the Triple Crown and offered an incredible amount of inspiration! I also ran with a new friend, Barkley, who visited me later in the race, brought me a fresh peach, and unintentionally reminded me of why I was out there. I met my pacers/crew at mile 55. My friend, Rob, paced me for the first night and shared 30 wonderful miles with me! Shaun and his dog, Azimuth, later took over for most of Saturday and into early Sunday morning. A new friend, Chris, also came out from the Salt Lake City area, to pace me and share some Chuck Norris jokes! I started running with Jason on Sunday morning and into Monday night. I had attended his CTS running camp back in May, but this was the first time running together. I enjoyed getting to know him better, sharing stories, describing my out-of-body experiences to him, and hearing his advice/words of encouragement. Shaun took over again on Monday night and took me to the finish line! Much of this race was challenging due to running out of water and food multiple times, dealing with my tendonitis, trying to adapt to the cold and heat, and oh yeah, covering 238 miles! I do not imagine I will have many of these intense transformative experiences in my lifetime that span for months. 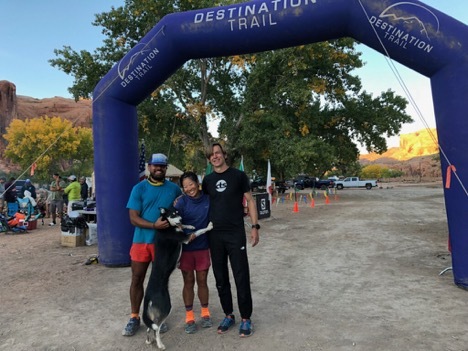 The training and races encouraged me to address my fears, increased my self-awareness, forced me to be vulnerable, connected me with some of the best people I know, and fostered self-growth. These experiences showed me the lengths I will go to to feel more alive, to increase my quality of life, to become more comfortable with discomfort, and to practice being more adaptable and resilient. We do not always like what we see and what we learn about ourselves when we run ultras, but I have used this information to create better and stronger versions of myself. I finished those races with an immeasurable amount of gratitude for those that were a part of my journey and supported me along the way. For those that paced me, crewed for me, wrote letters, made me food, shared water, trained with me, and/or encouraged me, please know that you now occupy a space in my heart and I will always appreciate these unforgettable memories that you have generously given to me. Know your why- You will most likely question this when you are racing. I would recommend that you become very familiar with the reasons you are doing a 200 and make sure that it is meaningful and motivational enough to help keep you moving when you are in pain, hit emotional lows, etc. Download the GAIA app and ensure you have the course maps completely downloaded. If possible, download it on your watch as well. If you have a lot of items in your drop bags and tend to forget what you put in them during the race, it can be helpful to take photos of the food and belongings before placing them in the bag (assuming you carry your phone on you). Try to change your socks out at every station and dry your feet out at the aid stations. Have at least one pair of shoes that is an extra ½ size or one full size larger than your regular running shoe. Wearing thinner socks may be best when your feet get swollen and your shoes feel very tight. Injinji socks may not fit over your toes if they are taped and/or swollen. If possible, soak Leukotape before removing it. If you have pacers and/or crew, it can be helpful to create and organize a spreadsheet with your race goals, tips (including how to respond when you hit a low), contact information for everyone, elevation profile, race schedule, estimated splits, and useful links (tracking). Pack sweet and savory foods. Have some back up food/snacks in case you get sick of your go to foods. Carry a 3L bladder for Moab even if you tend to be a light drinker! If you are prone to blister, I would recommend carrying a blister kit on you and try to take care of debris and/or blisters ASAP. Wear desert gaiters during Tahoe and Moab- my feet were completely free of any debris and sand. Reapply sunblock several times throughout the day and do not forget to apply to your lips. Carry a bivy sack or emergency blanket on you to take some trail naps if necessary. ALWAYS carry some wear gear on you. Try to take a nap if the hallucinations become severe – I have heard several stories of runners trying to push through it and have gotten lost and very disoriented. Take your shoes off during river crossings if possible. Carry anti-chafing cream/lube on you if you are prone to chafing- I like the small packets of Trail Toes, because they do not take up much space and you can cram them in smaller pockets. If you are set on dropping, take a nap first; even if it is 15-20 minutes. Those naps can really help with giving you a restart. The stick on heating patches feel are very effective at keeping you warm during colder temperatures. I placed them on my chest, neck, and back. Having some type of caffeine on you can be helpful when you are extremely sleep-deprived and cannot keep your eyes open! Having hand-written notes or letters from loved ones and/or friends in your drop bags can be extremely uplifting! Make sure ALL of your drop bags are waterproof and are sealed tightly. If you have a pacer or pacers, determine where you think your hardest sections may be (night, big climbs, etc) and see if they can jump in then. If you are dehydrated or running low on water before getting into aid stations, try drinking a bottle or two of water before you leave the aid station. Ice bandanas feel wonderful during hotter temperatures and are very easy to make! Taking minerals and vitamins (potassium, Vitamin C, magnesium, etc. ), before, during, and after the races was helpful for me. Elevate your feet whenever you can! In terms of recovery, I found the following helpful: elevating, icing, walking short distances, stretching, rolling, cryotherapy, ultrasound, a lot of sleep, healthy food! Bring earplugs if you plan to sleep at the aid stations! It can be loud with the generators and runners coming in and out. I’ll just be ecstatic to run my first 100m and you hit the Triple Crown! Thanks for the inspiration, Katie. Nearly $3000 in just fees for 3 races is tough, though! What an amazing inspiration! Katie you are incredible. Thank you for sharing your story and tips! Gearing up for my 1st 100M in Feb! Great story. I enjoyed reading this. Way to go, Katie! It was great to meet you and Shaun on the trail after Shay Mtn.. I’ll be going for the Triple in 2018. Thanks for the inspiration! Congratulations! What a great test of mental, physical, and emotional strength. I found your first tip to be fascinating and important. If you can answer that it seems a lot of the mental game will fall into place.